Learn about the advanced message settings section. Scroll to Advanced Message Settings. Character Set: This setting doesn't display unless you've enabled internationalization in list settings. It allows you to select the type of alphabet characters to use in the message. Unless you need to communicate in a non-English language, you should leave this setting at the default, UTF-8. If you are using a character set that is not supported by UTF-8 this feature may be enabled. To learn more about enabling this feature, read Special Characters and International Alphabets. Soft Bounces: A soft bounce occurs when the recipient's mail server acknowledges the existence of the email address but can't deliver the email due to a problem on the recipient's end, such as a full mailbox or a server being down. Because the problem is usually temporary, many emails will go through on the second or third attempt. This feature enables the ability to resend the message for a specified number of days. If the email is delivered during the resend, that is counted as a success and the email address will be removed from the soft bounce list. If, at the end of the specified number of days, the message is still bouncing, it will NOT be unsubscribed from the list. Tracking: This setting should always be left on if you have conversion tracking installed on your website. It enables Listrak to track conversions (purchases) from your emails. 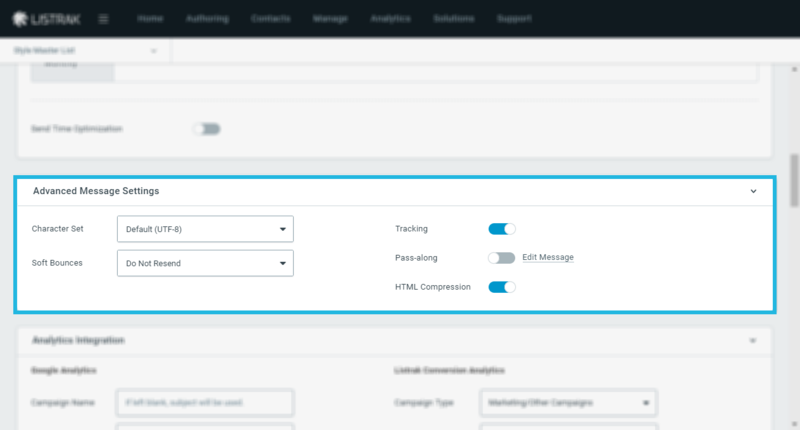 You'll be able to view analytics and report on the performance of your email campaigns. A quick way to see how your campaigns are performing is to go to the conversion dashboard. If tracking is turned off, any link clicks will not be tracked. As a result, click to open rates will not be reported. Read more about the dashboard in Conversion Dashboard. Pass-Along: The pass-along setting allows recipients to forward the email to colleagues, friends or acquaintances. The email address of the person to whom the message was sent will be captured as well. 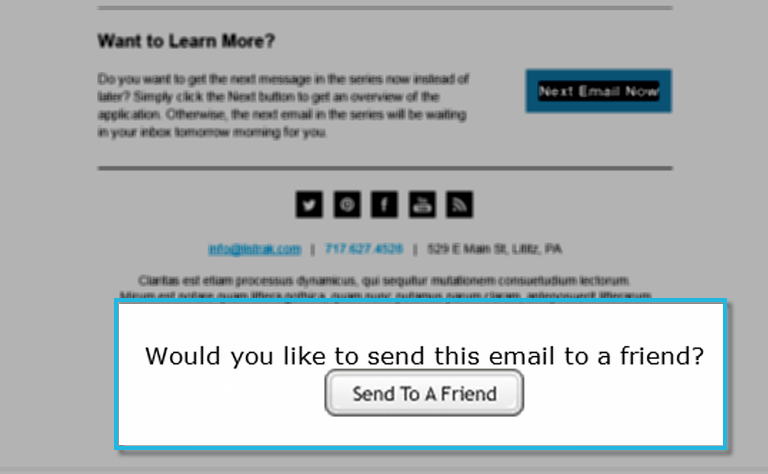 If this feature is enabled, the pass-along button will be added to the bottom of the message. To update the look and feel of this pass-along message, you can manually code the pass-along link and brand it according to your styles. If you'd like to edit the message that appears in the heading of the "passed" message, you can do so by following the steps for Update Pass-Along Text. HTML Compression: This will be enabled by default to help shrink the size of messages by removing white space and adding the appropriate character set. Learn more about the how compression will impact your messages.